Have you seen the Bonnie Maresh Fused Glass Buttons? Simply beautiful and very nicely priced, these buttons add beauty to any project. These wonderful buttons are hand made by Bonnie Maresh in Cape Cod Massachusetts, sold here individually each button is a unique work of art. Buttons are sizes small (approx 1/2 inch), medium (approx 5/8 to 3/4 inch), large (approx 3/4 to 7/8 inch), and extra large (mostly around 1 1/4 inches). Also hot off the press, a new batch of Penny Straker Designs patterns and project kits! Knitter-friendly patterns, with clean graphics, including illustrations of techniques, these patterns are written in a straightforward style. They take the knitter one step at a time through each section of a garment and are complete and accurate. We have the Penny Straker trunk show in house for you to see and we will take pictures for our blog for those of you who can't make it to the shop very soon. 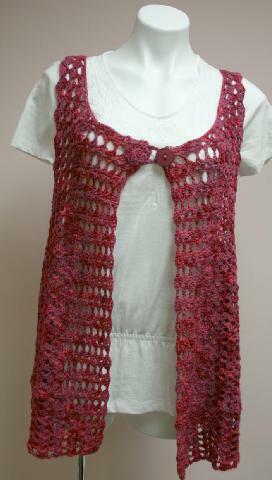 We have kitted these garments in our Project Kits section of the website with our favorite yarns. These garments are wonderful additions to your wardrobe or for gift-giving as they never go out of style!These and other gorgeous projects are available in the Project Kits category on our website! Have you seen the Cascade Lana Doro yarn? Lana Doro is a 4-ply supersoft 50%/50% blend of Alpaca and Wool that is simply yummy! 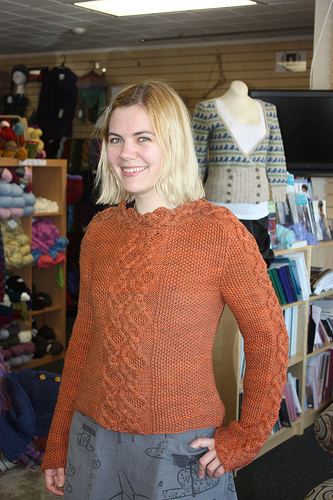 Cascade has also provided beautiful pattern support for the Lana Doro yarn. This is a great choice for a warm, comfy sweater or a beautiful scarf and mitten set! Check your email! A name has been drawn and the email has been sent for the November Prize Giveaway! We are gathering information on our next prize giveaway and will post it as soon as we have a winner for November. Have you signed up for our prize giveaway yet? It's easy! Simply go to the home page of our website and simply click on the Prize Giveaway Enter to Win section and sign up to win prizes, receive coupons and the latest news! 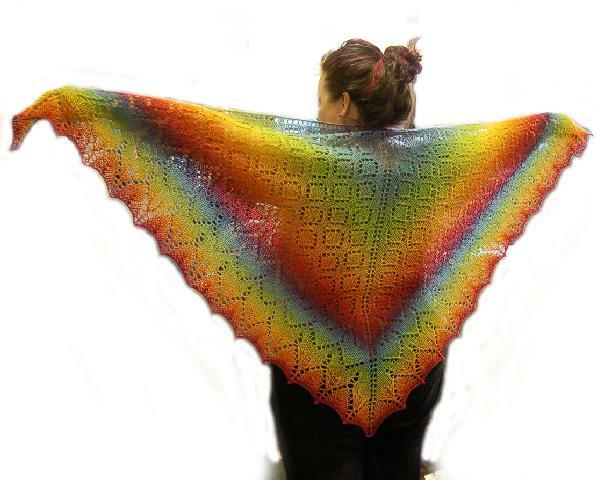 Have you the seen the Ivy Brambles Diamond Delight shawl made with only one 150 gram skein of Kauni? Kauni is the fun and self striping yarn that everyone is talking about! 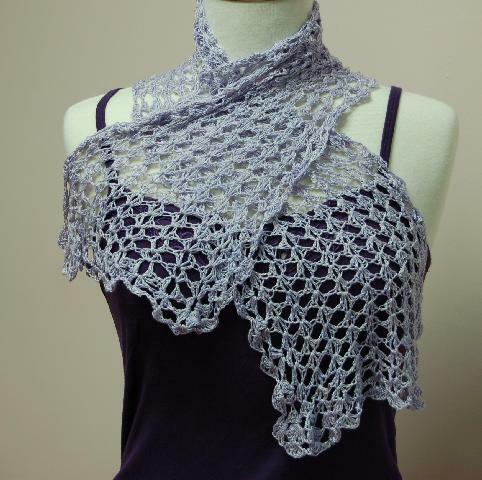 This beautiful and easy lace knit shawl works up in no time and is a sure pleaser! Shown in the pattern using Kauni EQ - the rainbow self striping colorway - this pattern works up great in any colorway. Another winning shawl you may have missed, Cherry Tree Hill's Figure Eight Fantasy Shawl - this gorgeous shawl looks harder than it is - made using a basic lace stitch, this shawl will draw oohs and ahhs while you are knitting it and while you are wearing it... one skein of Cherry Tree Merino Lace coupled with the Special Little Knits book is all you need to get started! A new fantastic pattern from Ivy Brambles - Oceans Edge Silk Shawl Pattern - A luxurious triangular shawl showing the pull of the soft waves washing over the rippled sand at the ocean’s edge. This spectacular design is both breathtaking and fun to knit that requires just one skein of Ivy Brambles Pure Silk 20-2 Yarn! Breathtaking! 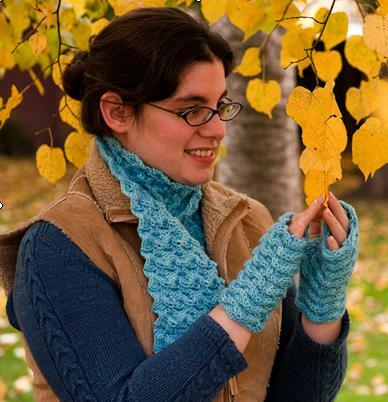 Need a gorgeous scarf and mitten set for yourself or a loved one? The Ivy Brambles Water Scarf and Mitt pattern are sure to work up quickly and easily with a fabulous cable pattern! This reversible scarf and mitts pattern is knit Ivy Brambles Superwash Worsted wool and is worked lengthwise making them completely adjustable in length. For our crocheters, we have new patterns available including the Ivy Brambles Crocheted Swing Vest which uses only three skeins of Ivy Brambles Sockscene Yarn! And don't miss the Ivy Brambles Crochet Split Shell Silk Scarf Pattern that is Pure Silk Luxury - finished dimension can be 38 to 64 inches x 9 - it is your choice how long you want it - and only one skein of Ivy Brambles Pure Silk Yarn is required for the long version! These and other gorgeous projects (like these gorgeous sweaters) are available in the Project Kits category on our website! These sweater favorites are the Ivy Brambles Walk in the Woods and the Gosport Sweater and Gawain Sweater all knit using the Ivy Brambles Superwash Worsted! Lots and lots of Blue Heron Rayon Metallic Yarn is now available in more colorways than ever before! 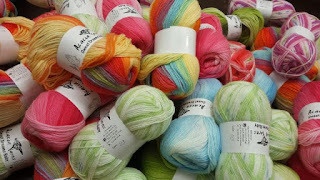 Check out our huge selection of this fabulous yarn that adds sparkle to any project! Fabulous free pattern downloads are available for this yarn in our Free Download section of the website! Also, just added to our shelves, a great selection of Cascade Yarns Lana D'Oro - a great 4 ply twist of 50% alpaca and 50% wool! 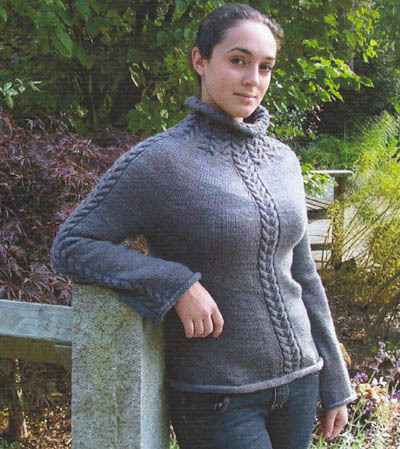 Check out this great yarn and the free pattern downloads for great sweater ideas! And, for our lace lovers! A new fantastic pattern from Ivy Brambles - Oceans Edge Silk Shawl Pattern - A luxurious triangular shawl showing the pull of the soft waves washing over the rippled sand at the ocean’s edge. This spectacular design is both breathtaking and fun to knit that requires just one skein of Ivy Brambles Pure Silk 20-2 Yarn! Breathtaking! For our crocheters, we have new patterns available including the Ivy Brambles Crocheted Swing Vest - this vest only uses three skeins of Ivy Brambles Sockscene Yarn!